S@ifur’s, you have heard the name before and yes, it’s that S@ifur’s who claims to provide English courses. Their glamorous advertisement can make anyone feel like they are one of the best English course providers in the world. But have you ever wondered how good are they? Do they really provide good English courses or its only business ? How benefiting are they for learners? S@fur’s has been robbing students’ money since it was established. They claim to provide a course which will make anyone a ‘monster’ in English in just 3 months. But in reality, they even failed improve anyone’s ABC of English. Moreover, they keep offering one after another course to the students and keep robbing them. 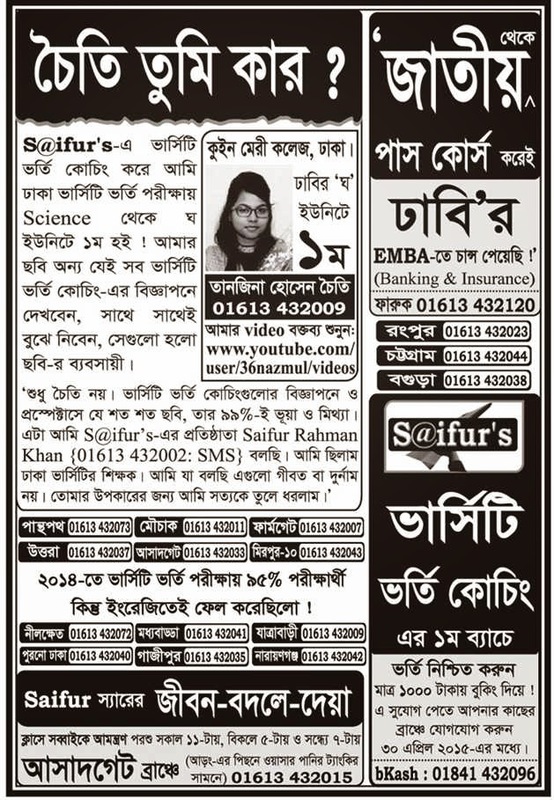 S@ifur’s currently provides Spoken English curse, writing course, varsity admission course, course for bank job, BCS, MBA etc. The fees for these courses are different in different branches. “I was impressed with S@ifur’s advertisement and their offers. Then I got admitted paying 6 thousands taka. Now I’m having to pay separately for spoken and writing course. 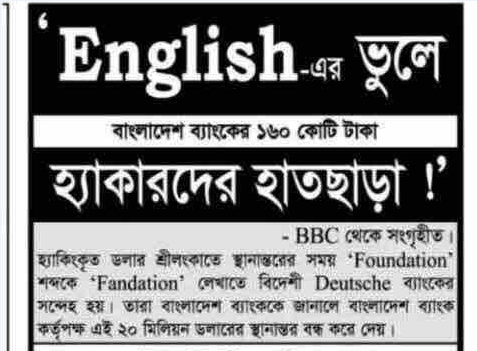 This is clearly fraud.” said a student of S@ifur’s of Mirpur branch. A job seeker, Adnan, once got admitted in S@ifur’s after seeing “If you want to speak English fluently, you have to complete S@ifur’s Master Program” advertisement of S@ifur’s. He was told that there will only be 20 students per class but he had to attend class with around 60 students. And the more saddening fact was the teachers. Those who completed IELTS from S@ifur’s were appointed to teach them. The lecturer used to lecture as they like without helping students to understand anything. And if had any students asked anything, they would insult them. So they wouldn’t ask question even if they had any. After witnessing this situation, Adnan left S@ifur’s just after one and half month. But he had to pay full fees of the course. Recently S@ifur’s was criticized because of one of their lamest advertisement. They said “1.6 billion taka was hacked from reserve because of wrong English.” This is not just funny but insulting too. A case was filed by Ministry of Education against them because of this kind of advertisement. But it is not the only time they advertised something lame. Once in a advertisement a headmaster was seen saying that his daughter was able to marry an Australian boy because she studied in S@ifur’s. How can a teacher say something like this for business is beyond anyone’s belief! Coaching business is against law and government should take necessary steps to shut down coaching business, coaching business like S@ifur’s and students should not be brainwashed by the advertisement of coaching centers.